Let’s be honest, who doesn’t love quesadillas? Warm tortillas with gooey melted cheese, how can you go wrong? What’s more, there are so many different ways to spruce up this classic appetizer that you are bound to please even the pickiest of pallets. Yep, quesadillas are awesome. Speaking of variations, I am excited to share with you one of my favorite versions of this tasty appetizer, which uses up a variety of farmer’s market finds to create a delicious and hearty vegetable quesadilla. What is particularly great about this recipe, is that it not only adds a new twist to the usual chicken or beef quesadillas, but it also uses up your bounty of summer veggies in a flavorful, fun and healthy way. With sautéed zucchini, yellow squash, mushrooms, red bell peppers, vidalia onions and a wonderful hint of garlic, these quesadillas are absolutely packed with flavor and make a wonderful appetizer or light and easy supper. Enjoy! Don’t have all of these vegetables on hand? Don’t fret! This recipe is incredibly versatile, just use equal measurements of what you have! When chopping your vegetables, try and keep them similar in size to ensure an even cooking time. 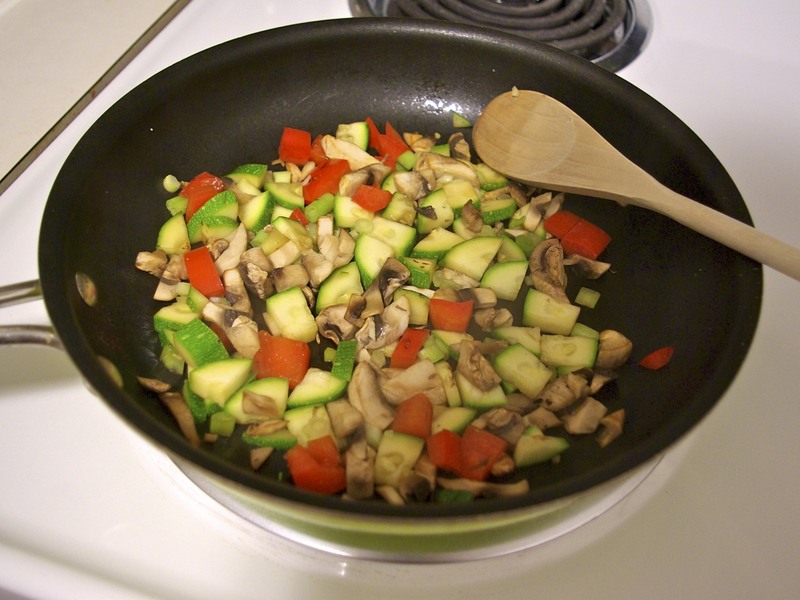 Add all chopped veggies, except garlic, to the skillet and cook until tender, about 7-9 minutes. Add garlic for the last minute. Salt and pepper veggies – to taste. Lower skillet heat to medium-low, and using the same skillet, place one tortilla in the pan. Sprinkle 1/4 cup cheese evenly over the tortilla, layer a quarter of the vegetable mixture over the cheese. Add an additional 1/4 cup cheese over the veggies and top with another tortilla. 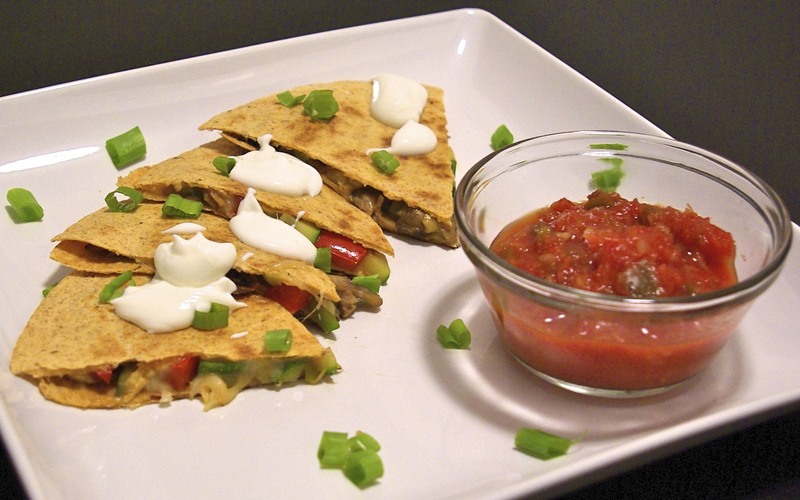 Cook quesadillas until golden brown on both sides, about 2-3 minutes per side. Remove quesadilla from pan and repeat steps 5 and 6 with remaining ingredients. Using a pizza cutter, cut each quesadilla into 6 triangles. Serve hot with dipping sauces, if desired. I don't know why I never bother to make quesadillas. They're so much lighter than enchiladas or burritos, but for some reason I always stuff myself with them first. Summer squash has made an appearance in France this year. I was so excited! YAY! That's exciting! As usual, zucchini and yellow squash have taken over the supermarkets around here 🙂 I also love that the quesadillas are lighter than enchiladas and burritos, PLUS they are so much faster to make!